Michael Freeman is a second-year PhD student. His academic interests lie in Greek philosophy, religion, and myth. He is particularly interested in Neoplatonism, in late antique religion, and in literary papyrology. Michael received a B.A. in Ancient history and Classical languages in 2017 from the University of Pennsylvania, where he also worked on exhibition development with Penn Museum (link here to an academic review of the exhibit developed). 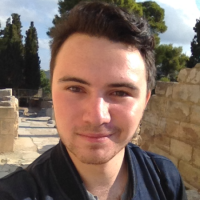 During the 2018-19 academic year, Michael held fellowship through the Rubenstein Library through which he developed a hands-on, introductory module on Greek papyrology taught as apart of the course “History of the Book” (CLST 360).